The colour for September is Soul Pea. I have recently printed just over a hundred photos, so I have plenty of new ones to choose from. This one is of Chelsea having put on her green top all by herself. However she put it on upside, so of course I had to get a photo of that, and Michelle helped by holding the top up for a better photo!! The top reads Perfect. I mixed my Snow Cone gelato with some modelling paste and used an icing sugar stencil. I got a pack on clearance at the Warehouse a while ago for $3 and I will get more use of out them as scrapbooking stencils than for any cakes! 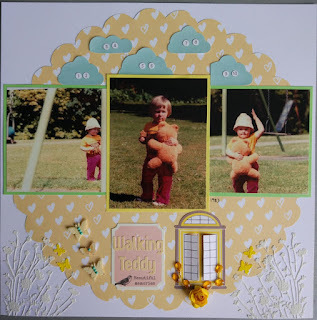 I've had the green bunting for a long time, it comes on a 12x12 piece of paper, you just pull of the amount you want, so I've been using bits of it as I need it. Added a tag and a few flowers to finish. 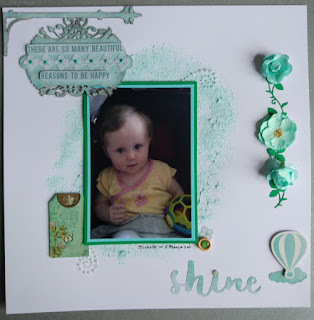 Cute photo and love the background stenciling! Thanks for playing along at White ... with 1. Love the stencilling, that design is a fave of mine. Cute photo, and terrific layout. Thanks for joining us at WW1. 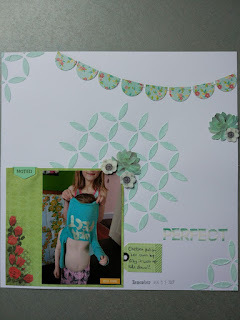 Lovely layout Chelsea, its always good to scrapbook all events and mishaps.